Thank you for your patience whilst the upgrades have taken place. It has been a huge task to re-structure 15 years worth of data to meet the requirements of the new version of the software, their most radical update for many years. There were a huge number of databases, settings and user groups to consolidate - I won't bore you with the details. There are a number of Background Tasks still running, to rebuild content slowly so as not to cause server resource issues. Those tasks are triggered by forum activity (people logged in and browsing the site), and until they finish, some of the layout may not be correct, such as quotes, signatures, lists, images, etc. So please bear with it for the next day or two. Hopefully you will get to grips with the new layout quickly, the post dialogue box is a lot more user friendly now and adding images is a lot easier. Video embeds should also return to full functions in time as well and there are some neat little buttons you'll see along the button allowing you to opt-in to notifications on replies for certain threads. Fans of social media will notice that the forum now has a simple button to react to posts, rather akin to the "Like" button on Facebook. This allows users to rate posts in technical sections to help novice users identify advice that is supported by more experienced members, for example. This is the little heart on the bottom right of each post. We have a new section entitled Parts and Cars, where you will find a link to the Classifieds listing, plus a new feature we are trialling called "Swap Shop" where members can trade parts between each other. Finally, there is a link to the Parts Quality reporting form. What we have going forward is a more up to date, more secure and more robust forum platform that we can build on for the future. 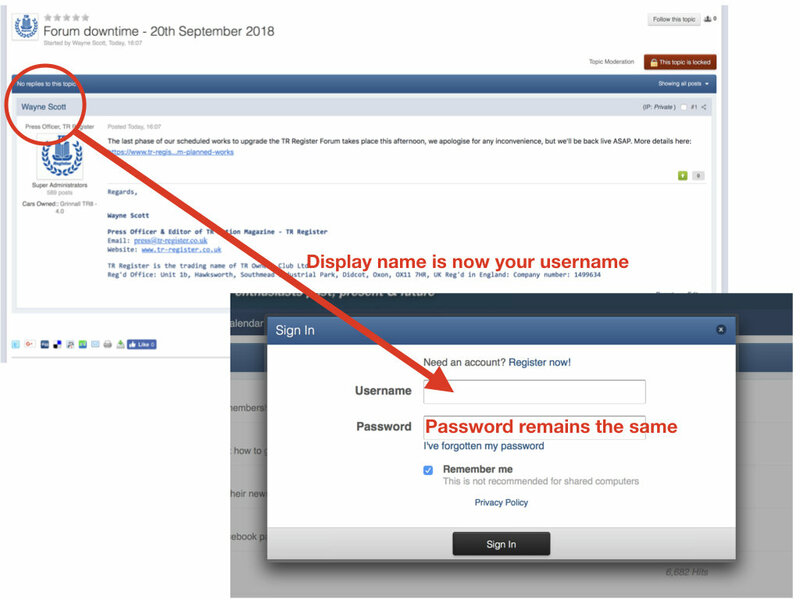 The next step now is to look into the new features for single sign-on now available with this version, so that we can integrate the forum more closely with our website members login. The end result hopefully, will be that multiple passwords are not required and rather than being out on a limb, the forum integrates into the website properly. Again, thank you for your patience and please bear with any little niggles that may need ironing out as we begin to work with this radically updated Forum software version. Your display name is now your username for logging in. Your display name was the name that was displayed alongside your posts on the forum as below. Use the display name as your username to log in. Your password remains the same.